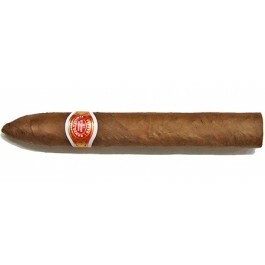 The Romeo y Julieta Belicosos a delicious and smooth mild to medium Campana, of 52 ring gauge, 5.5” (140mm) long and comes in a box of 25 cigars. It has lots to offer, with deep leathery and woody flavors and a touch of chocolate. It is a smooth and sweet cigar full of aroma that many compare it to the Montecristo 2. The Belicoso burns well and develops a rich creamy taste. It delivers immense taste and flavor while being a delight to watch while it burns slow, even and cool. Sweet, smooth and mellow the whole way. •	Not too strong but very creamy. •	Feels like an aged cigar. Smooth and medium with classic Romeo y Julieta flavors. Romeo y Julieta Belicosos is beautiful to behold, its appearance is perfect. When you smoke this cigar, you feel like royalty. Hints of cedar and dark honey. Nice even burn with and a slightly firm draw. Produces thick clouds of billowing smoke. The smoke is a medium strength and a cornucopia of tastes. You taste musk, barnyard and earth and... the sun! The second third brings leather and honey and continued muskiness. Delicious. The flavor evolves into strawberries & cream biscuit. Marshmallows too. In summary, a delightfully creamy, musky and sweet stick.